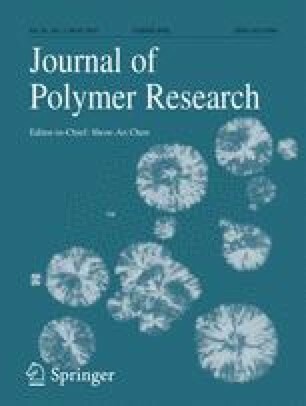 In this work, maleic anhydride (MA) and glycidyl methacrylate (GMA) grafted poly(ethylene octane) (MPOE and GPOE) were used to toughen poly(lactic acid) (PLA). Results exhibited that the MA and GMA strongly influenced the morphology and mechanical properties of PLA. The stronger interfacial reactions between the carboxyl and/or hydroxyl of PLA and epoxy groups of GPOE induced smaller dispersed phase sizes and higher impact strength than that of PLA/MPOE blends. SEM results showed that the shear yielding properties of the PLA matrix and cavitation of rubber particles were major toughening mechanisms. Rheological investigation indicated that the PLA/GPOE blends had higher storage modulus and complex viscosity at low angular frequencies range due to the high interfacial adhesion between PLA and GPOE. The results of DMA showed that all the PLA blends had lower storage modulus due to the low stiffness of the elastomers. Compared MPOE, the addition of GPOE significantly decreased the cold crystallization and melting temperature which indicated that GPOE could enhance the crystalline ability of PLA.